While the world is still talking about the recent Samsung Galaxy S9 launch, the next company in the pipeline for a major spring release is LG, and we’re just now getting more information about the LG G7 ThinQ design. While this most recent information gives us a clear sense of what the phone will be like, we had an idea of what to expect from the phone since we started seeing leaks back in February at the Mobile World Congress. Thankfully, thanks to serial smartphone leaker Evan Blass, we have a close look at the LG G7 ThinQ design that should be a clear picture of the actual device that is set to see a consumer release. 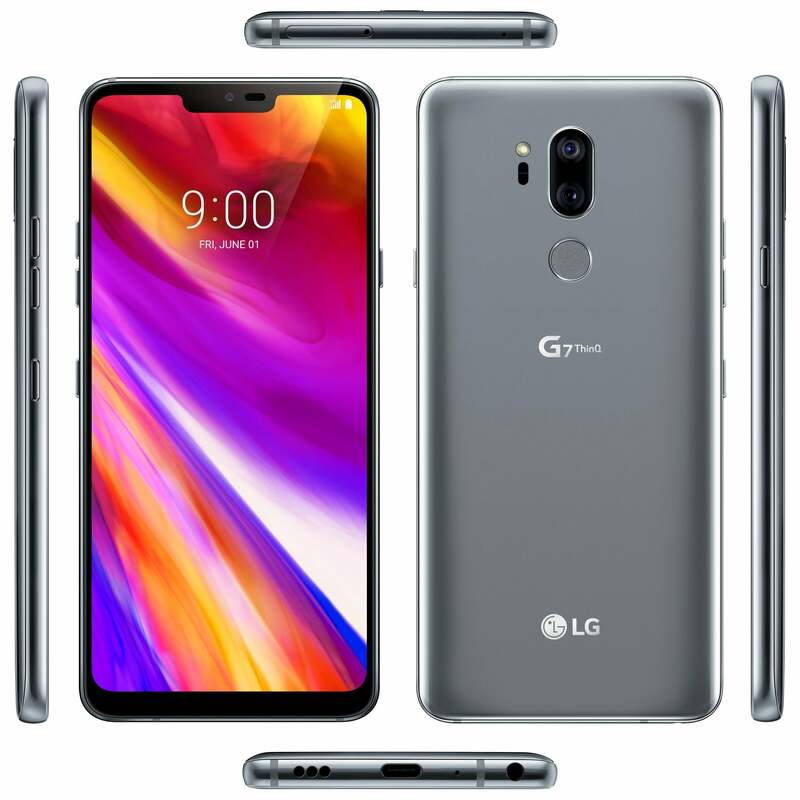 The image, included in the tweet below, shows us pretty much what we were expecting from the LG G7 ThinQ design – a phone with an iPhone X-style notched display. The decision to include such a feature on the LG G7 ThinQ has been questioned by many fans who were not a fan of the aesthetic. Indeed, it was a strange choice for Apple to go for an aesthetic that flew in the face of the recent smartphone trend to have an edge-to-edge seamless display – but it appears to have paid off for the company with the X becoming the fastest-selling iPhone in history. The LG G7 ThinQ design clearly takes inspiration from the iPhone X, and there’s no doubt that the company is hoping to ride on the success of Apple with the introduction of similar features in their new flagship. While we did have some idea of what the phone would look like before this most recent leak, Evan Blass’ information lets us see the LG G7 ThinQ design from every angle – giving us a clear look at all the buttons and features we can expect from the upcoming device. It’s clear that the phone will ship with a rear dual-camera design, as we expected, and while it might be difficult for it to keep up with the likes of Huawei’s phone with a shocking triple-camera display, it’s still likely to take some beautiful photos that will make the G7 ThinQ a solid choice for those looking for excellent smartphone photography. We were also relieved to see a headphone jack – a feature that is becoming less and less common as phones get thinner and thinner and companies try to cut features to save space. While Bluetooth headphones have come a long way, they still have a battery life you have to worry about and you can often find yourself stranded without a charger. We’re big fans of LG’s decision to keep the jack, as the omission in the last couple of generations of iPhone was definitely premature. Also included is a USB-C port on the bottom which should support speedy charging. While the LG G7 ThinQ design isn’t necessarily revolutionary outside of the iPhone X-esque notch, the button layout does seem to be a little different on this year’s flagship. For fingerprint sensors in the past, LG has typically decided to use a rear fingerprint reader with a physical click action that allows it to function as a power button as well. However, every leak this year has suggested that the LG G7 ThinQ design would feature a traditional side-mounted power button – suggesting that we may also see a traditional fingerprint sensor as well. There’s also another button, which Cnet reports will launch the Google Assistant. As far as specifications go, we should see a Snapdragon 845 processor, 4GB of RAM, a 2000 mAh battery, and a six inch, 3120×1440 display. With a launch date set for May 2, we should see more about the phone over the next few days. While LG has failed to capture a significant portion of the market when compared to giants like Apple and Samsung, that’s not to say that they can’t manage to deliver a quality device that can go toe-to-toe with the best of the best. After a lackluster reception for the Galaxy S9, LG may be able to see some significant sales if they are able to succeed where Samsung failed with their most recent handset. We’ll have to wait until the phone’s launch on the 2nd to really determine whether the phone has what it takes to compete in this ultra-competitive smartphone arena.